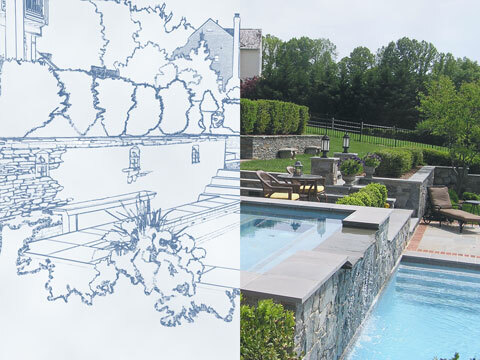 Our skilled professional designers offer complete landscape design services from conceptual sketches to exquisitely detailed master plans. Our design process always begins with listening closely to the client’s ideas, goals, concerns, needs and budget. It ends with a beautiful outdoor space that the homeowners will enjoy for years to come. Consultation services are available to help evaluate the existing conditions of a property, such as grading or drainage issues, as well as strategies to promote better plant health and overall appearance. In addition, consultations are also used to discuss design ideas to increase beauty and functionality. 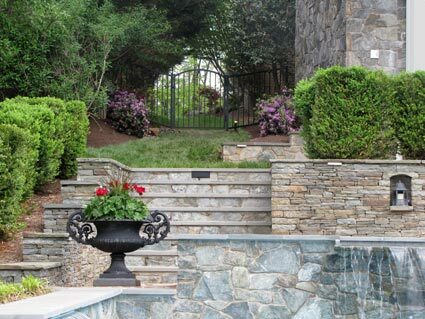 River’s Edge Landscapes specializes in creating all types and styles of water features including waterfalls, natural ponds, formal pools, fountains, bubblers and more. Whether you want a subtle or high-impact water feature, water adds new dimensions of movement and pleasing sound elements to your garden. 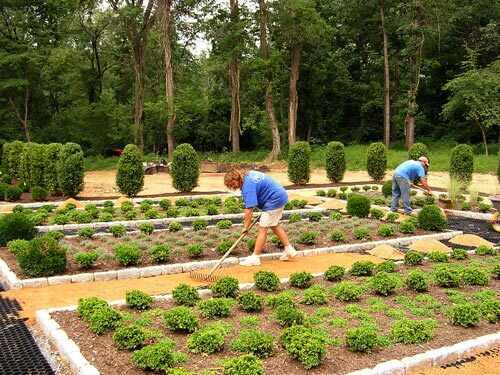 Our complete landscape installation service includes extensive bed preparation and soil amendment, selection and placement of high quality plants and materials, and exact detailing. 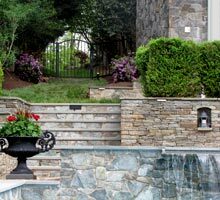 We offer complete landscape construction services which include: full masonry stone walls and patios, dry-laid stone work, brick, paver and stone patios, walls and walkways, paver driveways, arbors and pergolas, building outdoor structures and creating outdoor environments complete with fireplaces, fire pits and outdoor kitchens. You can keep your property healthy and looking its best at all times without the worry. 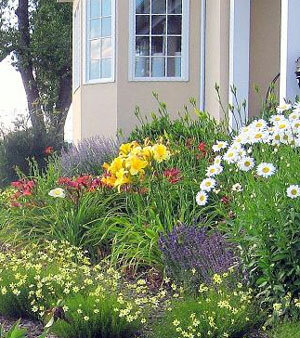 We provide custom landscape maintenance programs to fit your objectives and budget. 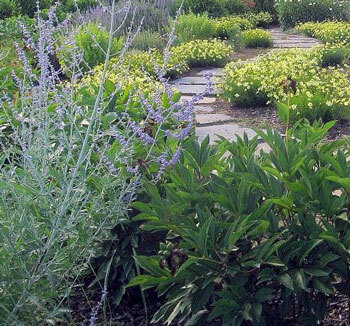 Our maintenance services include on-going garden maintenance, monitoring and inspecting plants for disease and/or insect problems, applying deer repellent where needed, applying organic plant food when needed, pruning, dead-heading, weeding, watering, hand-spade bed edging, mulching, leaf and debris removal, Winterizing gardens and property clean-up. We believe your landscape should compliment your environment and provide peak performance with minimal effort on your part. This begins with installing sustainable landscapes. 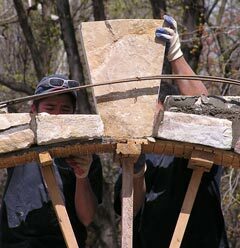 “Sustainable landscape design” is the integration of landscape choices that thrive in a specific type of environment. River’s Edge Landscapes is certified in Sustainable Landscaping, and qualified to facilitate collaboration between structure, topography, soil, water, plants, animals and humans. By integrating local resources and natural systems with creative strategies, we can create the sustainable potential of any home landscape. Your own food source! River’s Edge Landscapes can advise, install and maintain your own organic vegetable, berry and fruit gardens. Enjoy your own fruits and vegetables at their freshest moments, when they’re the most nutritious and delicious, as well as being free of added chemicals and pesticides. We also install various types of deer fencing and rabbit barriers to protect your fruit trees, berries and vegetables. If you’re getting hungry at the thought of an edible garden…give us a call! 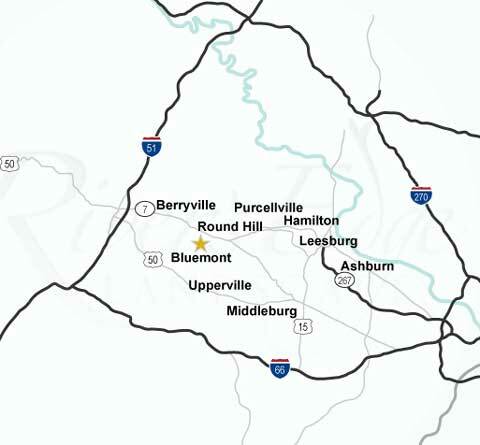 Not sure if we serve your area? Call us!